Property Details: 3 Bedroom, 2 Bathroom Vacation Rental, sleeps up to 9. 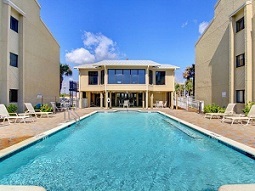 Shipwatch Surf and Yach Club condo, beach resort home in Perdido Key. Enjoy the best of both worlds at our beachfront vacation condo in Shipwatch in Perdido Key, Florida. This unit will impress! We have just completely remodeled the unit for our guests. In the Spring of 2016 we have freshly painted the entire unit, new furniture, new carpet, new bedding, 2 new Smart tv's 2 TV with Netflix and Amazon capability, new Keurig coffee maker, WIFI. This unit has granite countertops and stainless steel appliances, this three bedroom condo is one of the penthouses boasting an incredible view of the white sandy beaches of the Gulf of Mexico. Shipwatch and its sister building across the street on Ole River features a outdoor swimming pool, sauna, hot tub, tennis courts, boat launch, and boat/trailer parking. Great dining, shopping and entertainment in walking and driving distance! Shipwatch Surf and Yacht Club Condo Rental in Perdido Key FL.